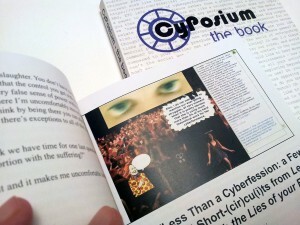 Cyposium; an online symposium organised by a group of digital artists (including ADA members Helen Varley Jamieson and Vicki Smith) took place over 12 hours on October 12, 2012. It gathered an excellent response to original call and from that nine presentations and an introduction were programmed with plenty of time for audience discussion in between. The proceedings, text chat logs, screen grabs, email correspondence and follow up articles have been edited by Annie Abrahams & Helen, rendered into copy and Cyposium – the book was launched which was released to print and digital download in 2014.